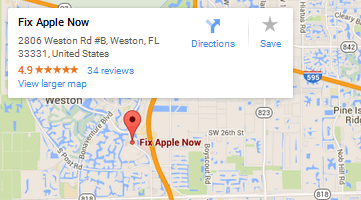 Below you can find driving directions from Google Maps to help you get from Palm Beach Gardens to your nearest Fix Apple Now store, situated in Weston. You can either copy the driving instructions below or click here for a larger map and driving directions. Talk to Fix Apple Now if you need to repair, mend, fix, restore or replace your broken Apple device in Palm Beach Gardens. We can help you bring your device back to life quickly, so why head anywhere else if you require a fix for your iPhone 4, 5 or 6, Apple Mac, Mac Mini, iPad, iPod or iPad Mini?